It is finally December my favourite month of the year and I'm nothing short of over the moon. I could go on and on about why I love this time of year. My birthday is in December, I adore the lights, and the festivities in general. Also in the months of November and December two of my loves combine in the form of makeup Christmas Collections, which is what I'm talking to you about today. At the beginning of November Lancome launched their Christmas Collection for 2015 and I was drooling over the range. In the collection there are some nail varnishes, a lipstick, a mascara, and a face powder but what really grabbed my attention was the eye and lip palette. Prior to this palette I had never tried any makeup from Lancome so I suppose the range intrigued me in itself but I was very curious about the way in which the lip colours in the palette were stored. I'm yet to come across a single eye/lip combo palette that I have enjoyed. I just find they generally don't work. When you pick up a little eyeshadow on your brush 90% of the time you will have excess product in the pan. The problem then is having a cream product next to the eyeshadows, it usually ends with the two textures mixing which can be extremely inconvenient. Not to mention the aspect of cross-contamination! However, that won't be the case with this palette as there is a swing lid which adds a layer of protection for the lip products. Such a simple concept but extremely effective! For the price I had expected the palette to have been a little larger, I was slightly surprised when it arrived to be completely honest. The palette houses six eyeshadows, a hydrating lip base and two matte lip colours. There is a dual ended eye and lip brush contained in the palette and also a decent sized mirror. Stuck onto the mirror there is a step by step guide showing you how to create a day and night time look using the palette. The shadows and steps are numbered so it is very easy to follow, a great guide for beginners. Being that the palette is small and contains a brush and a mirror it is handy for on the go, especially if you need to top up the lipstick. As you can see the eyeshadows are contained to the left hand side of the palette while the lip colours are towards the right. I rarely use the brushes that come with eyeshadow palettes because a lot of them generally aren't great. The limited edition Lancome palette comes with a dual ended eye and lip brush and it's pretty good! I love the angled eyeshadow brush it's great quality, nice and dense and packs eyeshadow onto the eye really well. 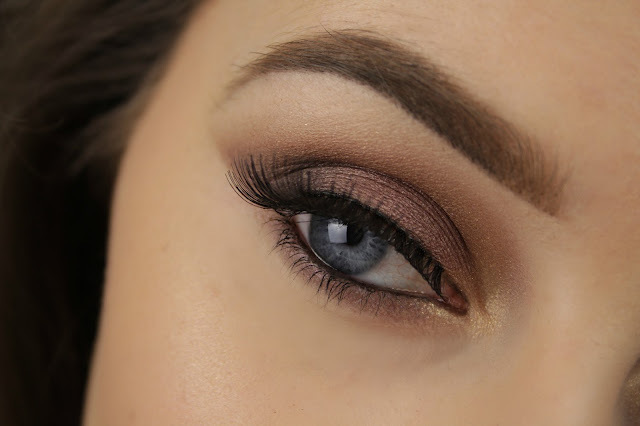 It's also great for blending the edges of the eyeshadow to ensure no harsh lines. The lip brush is also good, its not revolutionary but it gets the job done. The only thing I feel that is missing from the palette is a dark matte shade to add depth to the eyes. I found the dark purple with the glitter in it a little too chunky and not ideal for creating depth. I just found the look too shimmery then overall. I would have preferred a matte black or brown eyeshadow in place of the hydrating lip base as I can't see myself using that too much. Other than that its a really nice palette for creating a glamorous smokey eye. The lip colours in the palette compliment the eyeshadows nicely and when worn together I think they create a nice party ready look for the festive season...or for any season for that matter! The Lancome Christmas Collection 2015 is available now at select counters in Debenhams and the La Palette 29 Faubourg Saint Honore will set you back €55. The range is limited edition for Christmas so if you see anything you like snap it up quickly!